No its not normal. Get it checked from some expert or replace gear oil. is this IT-3 form needs to fill after the fiscal year completion and my employer will adjust the refund amount in current fiscal year? He said the gear oil is good and does not needs replacement however the oil was a bit low in quanity therefore I bought a litre bottle and got it filled but the gears are not smooth enough what possibly can be the problem? 75/90 is very fine. if your gear is not creating any issues and are not slipping then i advice you not to have it opened. Not slipping, for the most part they are fine but sometimes first gear gets stuck a bit and that is also not much, now the current issue is that yesterday I washed engine bay after taking all safety precautions and now the car is missing with unstable rmp meter, what could be the reason? why did you wash the engine!!! it could be due to various issues - maybe some sensor got fried, fuse box is wet, plugs are wet, coils are short...maybe missing is just one of the many issues created (hopefully not). I am facing a minor vibration in my swift at speed betweeen 40 and 60. Initially the vibration started with radiotor fan. Got the engine mounts checked and replaced one . Got all piping and silencer checked but the peoblem still persist. Any suggestion? Has anybody else experienced similar problem . Any solution? I have couple of other suspect areas. If it worked for me then i will update the forum. 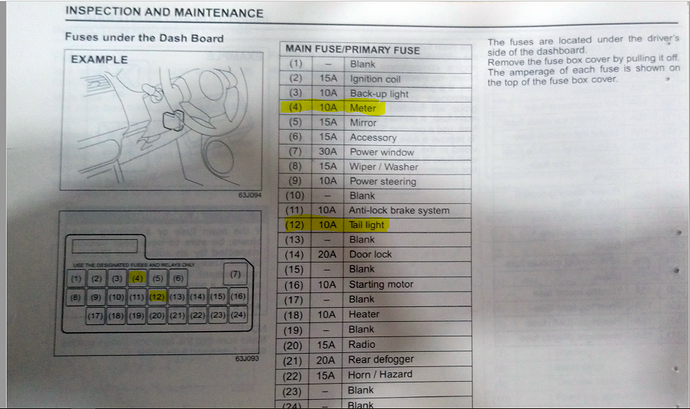 Kindly check highlighted fuses, there are two fuses one to control Meter light and another to control tail light. might be these are blown. I dont have any exp about Swift petrol consumption..yesterday tuned it for petrol ...50 KM per ager 1.3 Line kam ho Matlab fuel meter last 4th line se 3rd ke thora se neechey ayi ha 50 KM me ...hows the average? Fuel guage falls slowly in start. So if you get 250 kms in half tank, it does not mean you will get 500 kms in full tank. Also to calculate the average, fill the tank with auto stop. Consume fuel and when reserve light turn ON, refill again , and then consume, then compute. Well I washed it after covering it, however the rpm initially was jumping high and low quite heavily like instantly moving from 1k to 3k then back to 1k now it remains at about 800 to 900 but the issue is that it is still not static and keeps moving up and down below 1k rpm, what could be the problem? Anyone? When gear is hard to shift, turn off the engine and then shift. If it shifts smoothly, it's probably warped flywheel, or some pressure plate or clutch plate issue. Did you get the flywheel polished? If not, that's the culprit. Sometimes tooling machines are mis aligned and they cause slightly uneven tooling of flywheel or some mechanics even don't tool the flywheel at the time of clutch and pressure plate replacement (especially if it's replaced before it's worn out). I suspect warped flywheel, with confidence. It may not be tooled at all or incorrectly tooled. Gears shifting gets smooth with engine turned off? If it's gear issue, then it will stay hard even with engine turned off. check Plugs and coils for wetness. also, open up your IAC valve and clean it with carb cleaner - just a 5 min job yourself. gear shifting is not that hard but not completely smooth as well, when turned off it better than when the engine is running, I got the clutch, pressure and bearing changed a few days ago and the flywheel was also tooled ( as per the mechanic ) but still it is not completely smooth say its about 95-90% good not but not 100% when it comes to shifting.